This morning, first thing, during my first cup of coffee, I decided to draw the foggy view outside my bedroom window. The faint grey outlines of the trees looked so peaceful, almost mystical. There was a small part of me that wanted to venture out and draw “in the fresh air,” but no matter how many times I checked the weather app the forecast continued to be 90 to 100% chance of rain all day. So I enjoyed doing the drawing in the cozy confines of my covers, the taste and smell of my coffee adding to my pleasure. It seemed a good way to start a day that I hoped would involved finishing and then starting some paintings. The initial drawing was not bad. 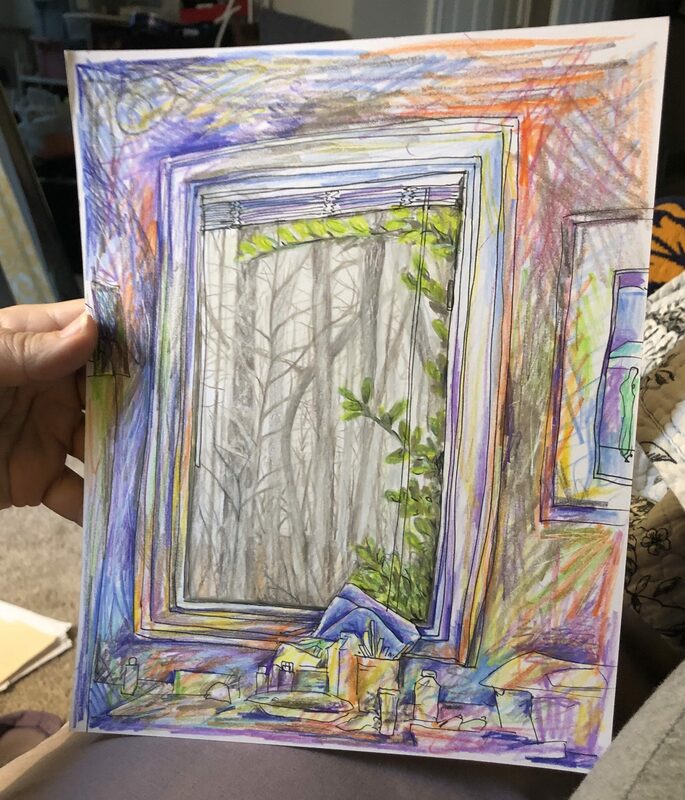 It captured the fog outside pretty well but my decision to just ink in the window and things on the worktable in front of it was not a great one. It was actually dimmer in my room than outside. The way I drew it made it look the opposite and lessened the mood the fog creates. I held it up and took a few photos, trying to capture the picture and the view like I do when I draw on my hikes. I drank more coffee and thought about different ways I could have done the drawing and why the photos were not very good. Then I realized what I really was thinking about was how it might look on Instagram. Just last night I sat and watched my daughter and her friends make a big production of taking pictures of themselves with their Big Macs before they ate their meals. I had wondered, rather critically, if they really liked that extra piece of bun and the special sauce or did they chose the most iconic sandwich on the menu based on how it would look when added to their “story?” Last night my judgement was quickly softened by their giggles and obvious joy in documenting and then devouring their dinner, but how does that relate to my drawing? A quick sketch would never be framed and hung on a wall. It was not even in a sketchbook I might someday let a friend flip through. If it did not get posted on social media it would never be seen. It would probably end up in a forgotten file with other drawings deemed too good to throw away, but not interesting enough to do anything with. Does that matter? Isn’t art supposed to be shared? Music played to an empty room, drawings that never see the light of day, novels that are never read, do they have the same value as art? Is experiencing the creative process enough? If I enjoyed the making of the drawing has it fulfilled its purpose? As an artist do I have the obligation to try and get my art seen? How is trying to get it placed in a gallery different from posting it online? And then when does it stop being about the drawing itself but how many “likes” registered? Is the image that gets 146 likes really that much better than the one that gets 19 or is it more about timing or the quantity of hash tags? Have I somehow just gotten around to asking, “if a tree falls in the forest does it make a sound?“ or “is the unexamined life worth living?” It does not take my meandering mind long to get ridiculous. An INTJ friend pointed me to an article on a site about introverted Myers Briggs types the other week to illustrate something. I spent a fair amount of time perusing the site and read an article about an INFP’s morning routine. I found its description of the rabbit holes we so often fall down very amusing at the time, but this morning I was annoyed rather than charmed by my own digressions. I decided to stop thinking about art and return to making it. If the picture was not good enough to share that did not necessarily mean anything about the intrinsic value of the sharing. It meant the drawing was not good enough. 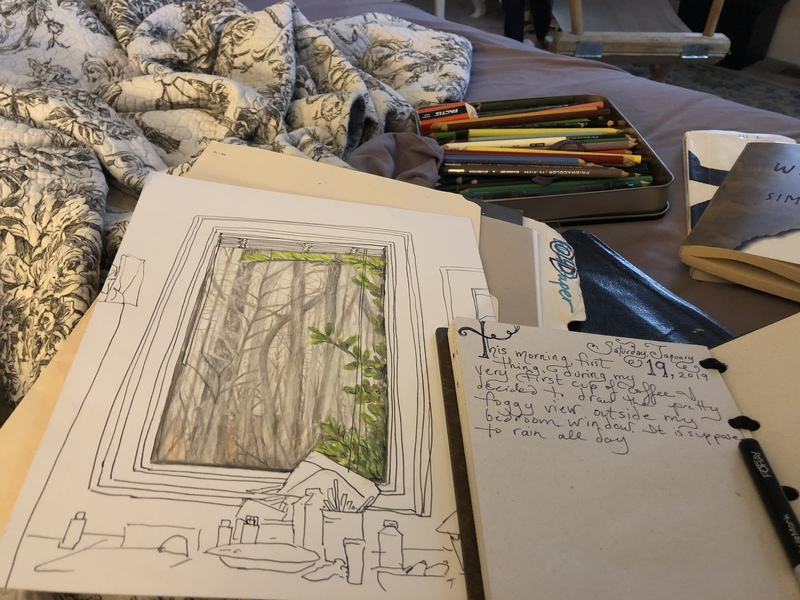 My purpose had been to enjoy the process but with the intention of a finished piece that in at least some small way captured the feeling of sitting in my warm bed on a cold foggy morning. I added layer after layer of colored pencil until it got too bright, then I dulled it down with black water color and then started back with the colored pencils again. It took a while but by early afternoon I had a picture that I hope shows an interesting contrast between interior/exterior, warm/cool and dark/light. I felt no qualms about sharing it here and to my other accounts. I think I may even put it in a frame and find a wall to hang it on. I was there on New Year’s Day, on Thanksgiving, on Christmas Eve and I would guess several dozen times in between. I went by myself, with family, and took friends. I walked the North Rim Trail, the South Rim Trail, the Terrora Trails, went up and down all those crazy stairs by day and under the full moon, sat by the lake, walked the Short Line trail with Max and Sophie over and over, and did a wonderful Ranger led hike down the short but incredibly steep Sliding Rock Trail. Watching the kayakers come through that day was especially amazing. And it was also that day (in November) near the the trailhead where I found my new favorite place to sit: under the South Wallenda Tower. I did my my first plein air drawing back in August from Inspiration Point. Since then I hiked to and drew other waterfalls which I have written about, but I have also drawn at the gorge many more times. Before finding my new spot I found it challenging to find a place to sit where I could be comfortable and out of the way of all the the other visitors. There are plenty of benches but, with the exception of the one at Inspiration Point, they just don’t have the views I want to capture on paper. The new spot, out of the way, with a grand view and no guard rail is so perfect. Today instead of oil crayons or colored pencils I took five tubes of acrylic paint. I spent over two hours painting the view of the gorge wall on the other side. It is a lot try and capture on one 9×13″ piece of watercolor paper. I know I would be more successful if I just picked one section at a time, but what thrills me about the gorge is the scale. The expanse and grandeur of it is what I want to try and get down on paper. I will keep trying, but really, as I have said many times before, for me plein air is so much more about the process than the finished product. It would be nice to have some really striking drawings and paintings of beautiful sites of North Georgia. I have thought about how neat it would be able to sell prints (or originals) to the people who stop and enjoy watching me work, and maybe some day I will get there. But for now the act of being there, sitting in front of such majesty and being 100% focused on it, is exactly what I need. It has been over a year since I read Peter Matthiessen’s The Snow Leopard. I have read and listened to many other books since then, but I think more images from his expedition to mountains of Nepal have stayed with me than from the rest of the stories combined. It is a very beautiful book. What he saw, how it affected him, and the words he used to share the experiences really resonated with me. If I was going to write a review of it I would have to keep returning to the thesaurus to find all the possible synonyms for breathtaking. If it had not been a borrowed book (Thanks, Jim) I would have underlined many passages, but towards the end the phrase “painting eyeballs on chaos” just reached out and grabbed me and I have been exploring it in my mind and in images ever since. Any one who knows my art work knows that for years I have literally been painting eyeballs (and hand and birds) on and in chaos. Depending on the piece, the day and my mood there are many explanations of what all those chaotic swirls of color and pattern might signify. There is not even a consistency within my portfolio as to whether the writhing shapes are positive or negative, internal or external, but they are certainly pervasive. However since spending so much time thinking on this phrase and what it meant to Matthiessen I have wondered how much of what I am trying to express in my art work could be simplified down to the problem of not being in the present and needing to get there. Sitting down to write this post reminded me that I never read Dogen’s Shobogenzo that Matthiessen is quoting, so I have just ordered a copy. I have read many Christian Mystics whose focus on mindfulness I believe is very close to the Buddhist idea of Zen, but it will be interesting to see if his writing matches what I expect (well, if I can understand a 13th century Zen master at all). Recent correspondence and conversations on meaning with intriguing friends have my thoughts going in many different directions, but I feel like somehow they will all spiral back together to the importance of being present here and now. Anyway, this post is not a book report, a dissection of the meaning behind my art, and certainly not a dissertation on philosophy or religion. I really just wanted to share that as I continue to explore these ideas I am now not only painting and drawing eyeballs on chaos, but I am tattooing them on as well! Dr. Victor Frankenstein is a rather sad subject for my final October drawing prompt, but he seemed more interesting to try and capture than his monster. I am going to miss the challenge of trying to complete a drawing every day. This one could actually use a bit more tweaking, but I am tired. As the month of October wanes overall I am pleased with the drawings I have created, but there are few I feel like I will revisit and try to improve. This is one of them. The little toad from yesterday makes a great hat for my swamp thing. Today’s prompt was Toad, so I drew one, but I have been wanting to draw a Poisonous Dart Frog since Scott and I talked about them last week, so I drew several of them as well. This drawing is based on a concept I had in mind for a half tattoo sleeve. I got a little more complicated than I would want to do for a tattoo, but I believe the idea is still a good one. I think it would wrap around an upper arm well and could easily be added on to if a full sleeve was desired later. If the original person I imagined as the canvas for it never comes back around I wonder if I could find someone else who would be interested. And if the monster’s presence becomes a comfort? Why do we so often act like we have pumpkins for brains? I must confess I did not draw this alien today. A couple of weeks ago I had a tattoo client who said he liked aliens, Aztecs and Polynesian designs. So I combined them all into a sketch of this guy. He ended up only wanting a small filler piece, but when I got my light box I redrew him with nice clean lines, and then tonight in honor of the Drawlloween prompt I took him into Photoshop for some quick coloring. I went ahead and took the whole day off to drive to Tennessee, even though I made the kids go to school for half the day, so I was able to get my drawing for today done early. I had no interest in drawing a seance, especially not while on my way to a Memorial Service. I had some neat ideas about drawing scorched trees, but ended up deciding on a ghost pepper, which I hear will leave one’s mouth quite scorched. My original werewolf scared me a little so I tried another that flips which parts are human versus wolf. He is sad instead of scary. The middle one is my attempt at making a tattoo-able image. This little Goblin just leapt out of my pen this morning. He did not take enough time to be a very good distraction so I decided that he needed an angular environment so I could meet both challenges at once. I googled ‘crystal caves’ to see what kind of source material I might find and I am now pretty fascinated by the extremely hot and humid (like over 130° F) crystal caves below Naica, Chihuahua, Mexico as well as the very different but still interesting Crystal Shrine Grotto at a cemetery in Memphis. I drew like half a dozen owls today. These three are my favorites. This one does not make sense, but I do not want to skip a day. I will redo it when I am not so very very tired.The view should be of the other side, with the thumb bones on top. This intriguing little statue is in the small graveyard in my neighborhood. I wanted to draw it from life but by the time I was home it was getting too dark, so I worked from a photograph I had taken back in March. I would like to try again sitting there in front of it. I think there are more interesting angles to be found. I wanted this to look like the swimmer was inside the whale, a Jonah using vast amounts of energy swimming in one direction while the whale took him the opposite way, but it didn’t really work. Before this drawing I don’t think I had ever spent much time considering bats or their anatomy. I am now rather fascinated with the way their wings have an uncanny resemblance to umbrellas. I have visited and drawn many waterfalls this summer and fall. In most of my drawings the water is really just represented by white space, defined by the rocks or foliage around it. I thought that by doing this drawing from a still photo rather than onsite I would be able to capture the water itself more clearly, but I found myself doing the same thing. On my next visit waterfall visit I think I may try to chose a small section and see if I can figure out a way to actually draw the flow of water. This one totally freaks me out. I am so glad the old baby-delivery stories are about storks, not spiders. I did not know what Yokai were before this prompt. Turns out they are a class of supernatural monsters, spirits, and demons in Japanese folklore, but many of them are part animal. Pencil sketch while listening to a Grateful Dead cover band. Should have made her doing the chicken dance. I admit to using photoshop to making this one more dramatic. This prompt seemed like one of the most uninteresting, but somehow ended up being one of my favorite drawings. One of the things that has been so neat about these drawing prompts is that they allow me to do different kinds of drawings of different sorts of things than I usually do, but this one looks like the majority of my doodles. I sketched this over 5 years ago for a friend of a friend, but it was fun to revisit it. Instead of doing Illustration Friday for the month of October I am going to try and do an ink drawing everyday using the prompts from Inktober and/or Drawlloween. Celtic Crow has asked all the artists that work there to also come up with lots of Halloween themed flash for the month, so I will be trying to do drawings that will work for that as well. Rather than create a new post every day for each drawing I will just add them to this post. I don’t know that I have anything new to say about how much am I enjoying my drawing hikes. Each time I go just reinforces the fact that it has become my favorite thing to do. And I think my most recent drawing is improved over previous attempts. This past weekend I went home to western North Carolina for a quick visit and to take my niece on a horseback ride around the Moses Cone Estate in Blowing Rock. I had never been on a horse before (don’t think I had ever even touched one) so I excited for a new experience. During my childhood our family walked around Bass Lake on the estate often. I remember not only the walks, but also the sense of magic I felt there. 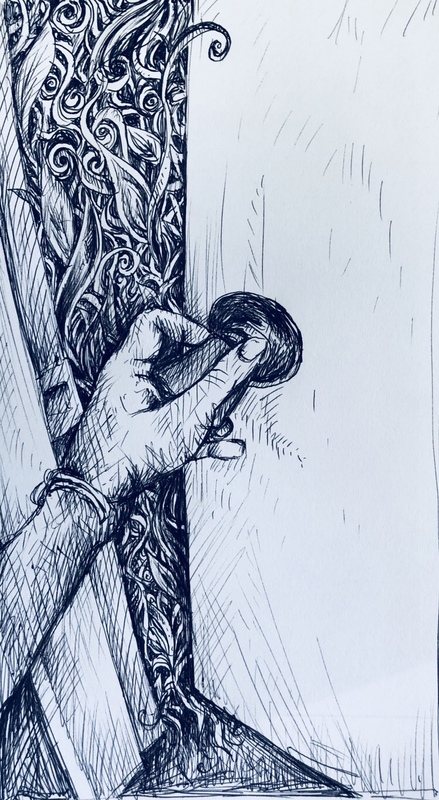 Though I cannot recall the details the feeling and mood of the fanciful stories I would make up about the fairies and other little folk that inhabited the lily pads, moss covered rocks, and trees with perfectly shaped and sized openings for their doorways are still clear. I also remember seeing the horses and their riders pass by on the far side of the lake on their way through the maze and up to Flat Top Manor. As a little girl I wondered what that might be like, now I know. My niece and I had a wonderful time on our 2 1/2 hour ride. The weather was perfect and after I got over my initial nervousness it was nice to watch the scenery as we slowly meandered up the path. But as fun as it was I found I missed the connection with the trail and the sites along it that I feel when walking on my own two feet, as well as the ability to set my own pace. On my way back to Georgia the next day I decided I should take try and fit in a walk and some drawing. At first it seemed like all the waterfalls were in the opposite direction of my route, or at least required quite the detour, but it turns out that Linville Falls could not have been more on my way. Back in college I went camping in the gorge a couple of times, but I had never been to the falls. They were the perfect choice, a non-strenuous walk on wide well-maintained trails to breathtaking overlooks. I spent about an hour at the Emerson’s View overlook doing a pencil sketch of the falls, then visited the other overlooks and spent another hour working in oil crayons on a drawing of the rock formations at the top of the falls. There were more fellow site-seers than I usually see in Georgia, but once I got in the zone of drawing I did not even notice them. I know I keep saying this, but it really was a perfectly lovely experience. There are two more trails that start at the visitor’s center so next trip to NC I would like to try one or both of them. I may need to start padding all my trips with extra time for walking and drawing. The summer between my seventh and eighth grade years my father taught a landscape painting workshop as part of Appalachian Summer. I am sure there was a classroom part of the class but my memories are of the time we spent painting outside. I have incredibly clear recollections of a day by the duck pond, an afternoon sitting on the rocks at Howard’s Knob and another at an old farm out in the county somewhere. After a hot water heater leak a few years ago I went through and piles of old art work and found several examples of the paintings I did that summer. Most of them were obviously done by a child. The lines and shapes seem a bit choppy, but some the compositions were actually quite good. This I think is due to the fact that one of the first things Dad had us all do was take a piece of mat board and cut a rectangular window in it. These were our viewfinders and we took them with us on each excursion. Before we ever sketched a single line on our paper we would slowly move our rectangles around the landscape trying to find the perfect slice of the scene from among the limitless possibilities. It made a huge difference. It helped find the right image to start with, but also made sketching the initial lines simpler, and as the painting progressed it could be held up again and again to verify details of the scene. I do not often think of the long ago course (could it really have been 30 years ago?) or the lessons I learned in it, but this past Saturday sitting drawing at Duke Creek Falls I realized I should still be trying to apply them. As I set on the steps leading down to observation decks I was overwhelmed by the view in front of me. Duke Creek Falls is not just one waterfall, it really is falls, plural. My eye did not know where to rest, and my first drawing reflects that. There is no focal point, no organization of the composition. It is confusing and lacks a sense of depth. If I had brought a viewfinder with me I think I would have done a much better job. My second drawing I tried to limit myself more, to focus in on one part of the falls. I even used my hands to make a little rectangle to try and plan what I would include. It is a more successful drawing compositionally. I am going to make myself a viewfinder this week and keep it in my hiking backpack. Hopefully next weekend’s drawings will be markedly improved. When we arrived at the falls there was a couple there with their little dog, who was not fond of Max, so we explored around the observation decks a while. A large portion is blocked off because of storm damage. The spot where the tree came through the deck would have been the perfect place to sit and draw the dramatic view of the water finding many ways to come down the side of the mountain. If I had not had Max with me I might have sat there anyway. But even though I may be brave enough to climb over barriers and check out the damage I would not want to risk Max getting too close to the edge and falling off, and I wasn’t eager to get fussed at by a ranger either. I do not know if they enforce the $500 fine for getting off the trail, but I do not wish to find out. We took some pictures and then went back to the “safe” areas. The benches on the lower observation decks did not offer the views I wanted to draw. We ended up sitting on the stairs leading down to them which was very comfortable until other folks started arriving. Then we may have been in their way, but I just held Max close to me as they passed and no one complained. There were far fewer people than at either Raven Cliff or Panther Creek. I do not know if it was because the site is not as popular or because it is after Labor Day. I drew for about an hour and twenty minutes then we walked back up at a nice relaxing pace.